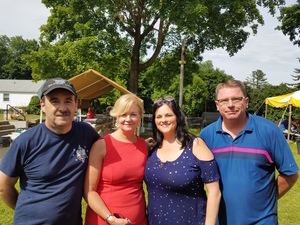 The Fraternal Order of Police Stephen P. Driscoll Lodge 704 in Carmel held their annual Pig Roast Fundraiser this past Saturday June 9, 2018 at the Brewster Elks Lodge on Rt 22. Over 100 supporters were in attendance to eat, drink and listen to music during the orders biggest fundraiser of the year. County Executive Maryellen Odell gave opening remarks along with the FOP Board President Joann Gervasi Viola who then honored Carmel resident Billy Moffit for his years of service to the order. The Board also commended the County Executive for all her support through the years. After the official ceremonies concluded the attendees were treated to typical BBQ fare along with a roasted pig (which was done on site) along with beer, wine and soda. Supporters were entertained by "The Lucky Basterds", a local band comprised of active and retired NYPD officers. Several members of The FOP Lodge 704 Stephen P. Driscoll Memorial Pipe Band were in attendance and entertained the crowd as well. The Pipe band and Lodge are named after Steven P. Driscoll, an NYPD Emergency Services Officer and Carmel resident who lost his life in the World Trade Center terrorist attack on 9/11. The Stephen P. Driscoll Memorial Lodge is a non-profit organization who received their charter in January of 2004 as part of the National Fraternal Order of Police. At the end of the day everyone had a great time and several attendees stated they are eagerly looking forward to next years event.